It is a little-known fact that before the advent of the bulldozer, in the days when draught dogs pulled beer wagons, dogs were widely employed as earth movers and military entrenchment technicians. Here, Roo demonstrates one of the ways her forebears might have assisted in the failed defense of the Maginot Line against the Hun. 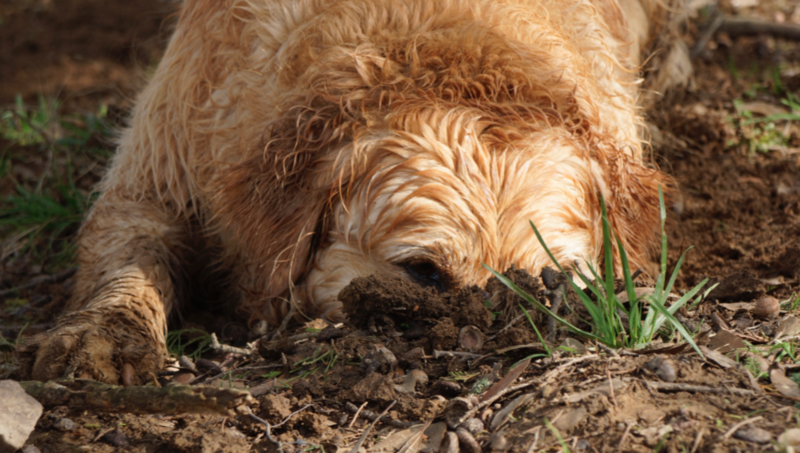 Even without the fitment of any type of cowcatcher or plowing apparatus, a dog with Roo’s crack training is capable of tunneling as much as two kilometers per day. Had there been a way to force a mouse to burrow along a predetermined path, that output could have been increased, but many dog programs ended when World War I did, and, fortunately, as the world’s militaries moved on to other methods such as large scale nighttime incendiary and nuclear bombardment, research was diverted to peacetime activities, leading instead to the development of other technologies, most notably among them the greyhound racetrack mechanical rabbit.